Please note that this current website does not have a shopping cart. 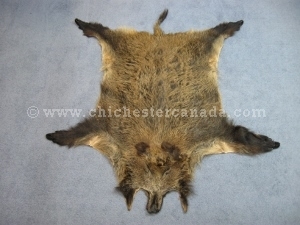 To buy our Wild Boar Skins online, please go to our e-commerce website at NaturalExotics.ca. We import wild boar skins from Hungary. These are high quality, tanned skins with the ears, snout, hooves, and tail. They are ideal for decoration by the fire place or mounted on a wall. Wild boar are not endangered and are not subject to CITES controls. These are the average measurements of the different sizes of wild boar skins. Extra Extra Large 60" 41"